Home » Architect » Architecture » Building » cement » Civil » concrete » Construction » Engineering » House » measurement » mortar » plane construction » report » Roofing » sand » surveying » test » What are Formwork Systems? 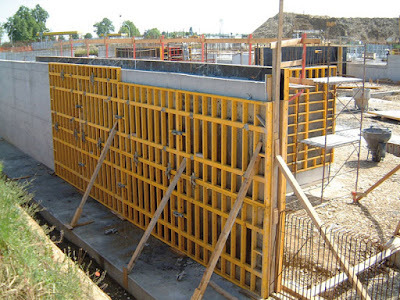 Formwork is temporary or permanent molds into which concrete or similar materials are poured. In the context of concrete construction, the falsework supports the shuttering molds. The formwork sector is being influenced by the requirements of improved workplace safety and crane-independent systems that are fast and reliable. Working at heights has become less hazardous. Due to these reasons, concrete formwork is becoming popular. A formwork system signifies the molds used to store and hold wet concrete until curing is achieved. Curing is a significant process in concrete construction. Concrete has been demonstrated to be the most suitable construction material for buildings and foundations since it withstands fire and ensures protection against storms and extreme temperatures. In addition, concrete contributes to the creative modern architectural design. Therefore, modernization of formwork systems was essential to keep pace with concrete advancement. As tall structures have gradually emerged to be the modern trend, formwork systems have also developed from being simple timber-based to pre-engineered structures of steel, aluminum, timber, plywood, and plastics. The formwork technology has translated into rapid construction with less labor. Re-usable plastic formwork. These interlocking and modular systems are used to build widely variable, but relatively simple, concrete structures. The panels are lightweight and very robust. They are especially suited for similar structure projects and low-cost, mass housing schemes. Self-climbing formwork was conceived due to the huge construction projects that were required to be completed in tight schedules. Workplace safety is an important requirement that has also contributed in the development of self-climbing formwork techniques. These techniques have reduced the requirement of cranes. Workers now function in an enclosed safe environment, and there is adequate space for the tools and equipment. A self climbing formwork presents an operational platform on which the concrete forms are placed, and the complete assembly is raised by hydraulic cylinders. Each construction project has dissimilar characteristics, due to which the assemblies normally are customized to ensure their effectiveness and safety. 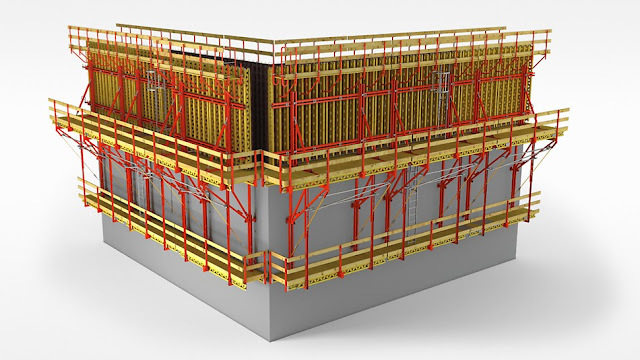 Enhanced workplace safety, reduced construction period, and better efficiency are available when self-climbing formwork techniques are used. This technique is appropriate for locations where availability of unskilled labor is restricted. In such systems, heavy machinery and high technology is not significantly involved. The method is technologically valid for nearly all kinds of buildings. 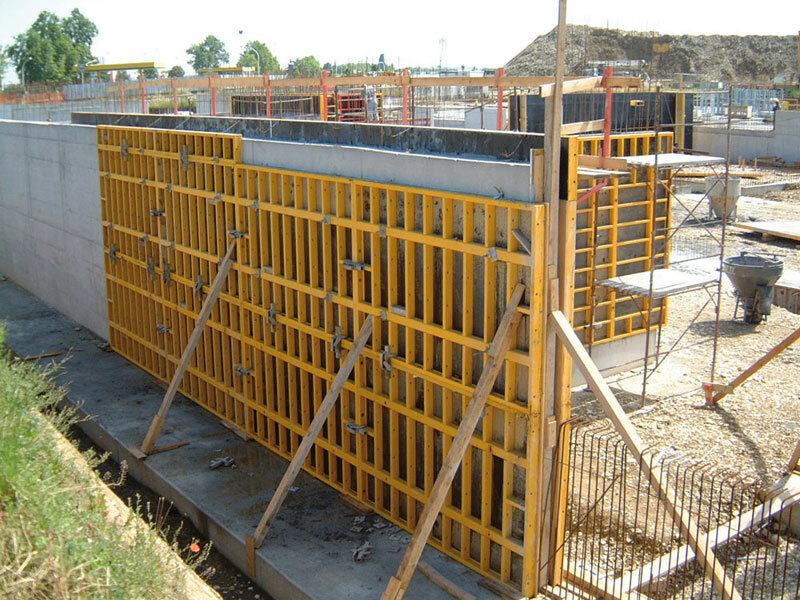 Formwork is utilized as a mold where wet concrete is transferred temporarily. The temporary system functions as a provisional support for the structure. This method is useful for the elimination and reduction of the conventional site based skills like timber formwork, masonry, and plastering. 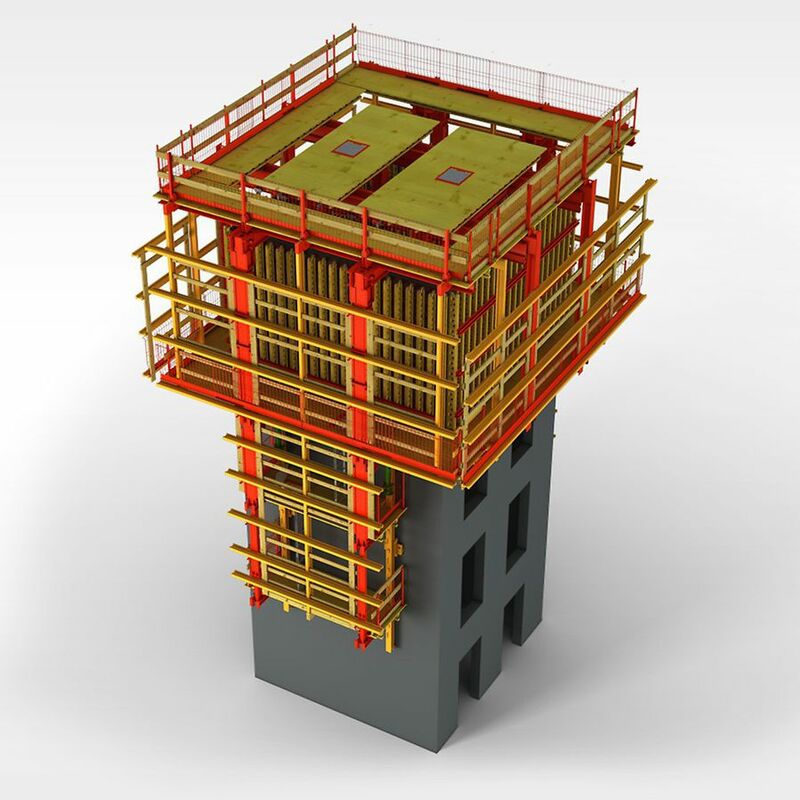 Carefully planned formwork can increase the production, speed, and precision of the construction. Usually, in main housing schemes the cost of formwork is approximately up to 10 per cent of the general project price, and the time involved is up to 60 per cent. However, engineered formwork is still gaining popularity. There is an increasing focus on sustainability in design, backed up by carbon dioxide emissions reduction targets. The low embodied energy of concrete by volume is offset by its rate of consumption which make the manufacture of cement accountable for some 5% of global CO2 emissions. Concrete is a fluid that offers the opportunity to economically create structures of almost any geometry - we can pour concrete into a mould of almost any shape. This fluidity is seldom utilise, with concrete instead being poured into rigid moulds to create high material use structures with large carbon footprints. The ubiquitous use of orthogonal moulds as concrete formwork has resulted in a well-established vocabulary of prismatic forms for concrete structures, yet such rigid formwork systems must resist considerable pressures and consume significant amounts of material. Moreover, the resulting member requires more material and has a greater self-weight than one cast with a variable cross section. Simple optimisation methods may be used to design a variable cross section member in which the flexural and shear capacity at any point along the element length reflects the requirements of the loading envelope applied to it. By replacing conventional moulds with a flexible system composed primarily of low cost fabric sheets, flexible formwork takes advantage of the fluidity of concrete to create highly optimised, architecturally interesting, building forms. Significant material savings can be achieved. The optimised section provides ultimate limit state capacity while reducing embodied carbon, thus improving the life cycle performance of the entire structure. Control of the flexibly formed beam cross section is key to achieving low-material use design. The basic assumption is that a sheet of flexible, permeable fabric is held in a system of falsework before reinforcement and concrete are added. By varying the geometry of the fabric mould with distance along the beam, the optimised shape is created. Flexible formwork therefore has the potential to facilitate the change in design and construction philosophy that will be required for a move towards a less material intensive, more sustainable, construction industry. For removable forms, once the concrete has been poured into formwork and has set (or cured), the formwork is struck or stripped (removed) to expose the finished concrete. The time between pouring and formwork stripping depends on the job specifications, the cure required, and whether the form is supporting any weight, but is usually at least 24 hours after the pour is completed. For example, the California Department of Transportation requires the forms to be in place for 1–7 days after pouring, while the Washington State Department of Transportation requires the forms to stay in place for 3 days with a damp blanket on the outside. Spectacular accidents have occurred when the forms were either removed too soon or had been under-designed to carry the load imposed by the weight of the uncured concrete. Less critical and much more common (though no less embarrassing and often costly) are those cases in which under-designed formwork bends or breaks during the filling process (especially if filled with a high-pressure concrete pump). This then results in fresh concrete escaping out of the formwork in a form blowout, often in large quantities. Concrete exerts less pressure against the forms as it hardens, so forms are usually designed to withstand a number of feet per hour of pour rate to give the concrete at the bottom time to firm up. For example, wall or column forms are commonly designed for a pour rate between 4–8 ft/hr. The hardening is an asymptotic process, meaning that most of the final strength will be achieved after a short time, though some further hardening can occur depending on the cement type and admixtures. Wet concrete also applies hydrostatic pressure to formwork. The pressure at the bottom of the form is therefore greater than at the top. In the illustration of the column formwork to the right, the 'column clamps' are closer together at the bottom. Note that the column is braced with steel adjustable 'formwork props' and uses 20 mm 'through bolts' to further support the long side of the column. 0 Response to "What are Formwork Systems?"